The occasion of our Sunday Journal News report on Section 8 housing vouchers is as good a time as any to discuss a policy distinction between fiscally conservative Democratic Gov. Andrew Cuomo and fiscally conservative Republican Westchester County Executive Rob Astorino, who is being touted as a possible gubernatorial challenger in 2014. Cuomo is proposing a statewide measure barring discrimination against Section 8 voucher-holders and other housing-seekers based on the source of their income; Astorino has gone to the legal mat to preserve the status quo, which limits housing choices for minorities, women, people with disabilities, veterans — anyone receiving government assistance. Reporting by Elizabeth Ganga and Tim Henderson reveals how limited options for those with Section 8 vouchers contribute to segregated communities. Their analysis of government data shows that the vast majority of Section 8 voucher-holders are crammed into a limited number of mostly minority neighborhoods — typically far away from the top-rated schools and other opportunities that abound in the northern suburbs. As the articles explain, different forces and circumstances help explain this de facto segregation; for example, in Rockland, vouchers are concentrated in the insular Hasidic Jewish enclaves of New Square and Kaser. But policymakers have long been mindful that bias and discrimination continue to be major factors — even when housing-seekers have stellar payment and credit histories. 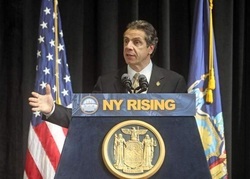 In Westchester, source-of-income protections were deemed so important in 2009, when the county settled its landmark fair housing lawsuit with the federal government, language was included in the agreement requiring the county executive to promote legislation barring such discrimination. The county’s representations to the federal Housing and Urban Development Department even acknowledged that source of income had become a proxy for racial discrimination. In 2010, the Board of Legislators passed legislation barring landlords from discriminating against housing applicants because they receive such help as veterans benefits, disability payments, or Social Security; landlords could still refuse applicants based on their “business judgment” — e.g., because the housing-seeker had a poor credit history — but they could not base their refusal on the mere fact that they received government assistance. Siding with federal housing officials, U.S. District Court Judge Denise Cote ruled that Astorino’s veto violated the settlement; her ruling is on appeal to the Second Circuit. Westchester isn’t the only community to struggle with this issue; property owners in Rockland have come up small as well. The U.S. Attorney’s Office stepped in to help settle a dispute between a Garnerville apartment complex and Loeb House, which provides housing for people with mental illness. Tor View Village Apartments stopped honoring payment guarantees on behalf of future housing clients from Loeb House. In 2010, a federal housing discrimination settlement was reached to allow the Loeb House guarantees to count toward clients’ income qualifications. Such protections can make a real difference in terms of promoting housing choice. Before New York City adopted such a ban in 2008, 90 percent of landlords refused to accept Section 8 vouchers; the prohibition was later upheld by the courts. The stakes are no less important outside the city, where unmet need for affordable housing, including for veterans and people with disabilities, totals upward of 10,000 to 15,000 units. Gov. Cuomo demonstrates that he is mindful of their plight, including his own source-of-income protections in his proposed Women’s Equality Agenda, which addresses issues ranging from pay equity to abortion rights and domestic violence. The state Legislature got behind such protections in 2010; they were turned back by then-Gov. David Paterson, who balked at the cost to taxpayers — estimated at the time at $2.7 million — during a time of multibillion-dollar deficits. Paterson also complained that the measure did not carve out adequate protections for small landlords. As we observed at the time, those small concerns were no justification for continuing to deny basic fairness and decency to vulnerable New Yorkers. With a willing governor on board, the Legislature should revisit the issue and pass new protections into law.